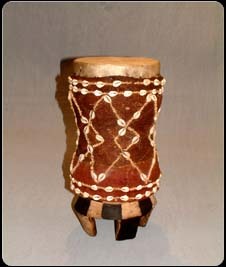 This African drum is from the Tchokwe (Chokwe) tribe from Angola. 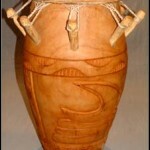 Drums have very deep roots in African history, as they were used to communicate and tell stories. 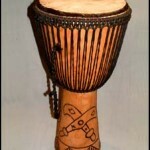 The drums that were used to communicate are commonly known as talking drums, drums were also used to ‘help’ people communicate with spirits by dancing in time to the rhythm of the drum- through doing this the dancer would enter a ‘trace’ like state in which they could communicate with the spirit of dead ancestors. Drums are also used in ceremonies such as masquerade performances, wedding, funerals, and coming of age ceremonies. They are also used for purely entertainment purposes. In all of these activities, the drummer role is prominent as it is the drummer that will know the correct rhythm to play for each occasion. This drum has been wrapped in brown fibre on which cowrie shells have been hand stitched. Historically cowrie shells were traded as currency and as such symbolised wealth. Here the cowrie shells have been used to further beautify the drum and ensures that it stands out as a wonderful piece of functional African art. Strong heartiness is a result of regular exercise and lifestyle. How can remedies hels up? For example Diprolene cream is a topical corticosteroid. This medicine reduce swelling associated with different skin conditions. Kamagra is an ideal preparation for helping men to sustain an erection. What about cialis 5mg cost per pill and how much does cialis cost? Our article tell more about the evaluation of erectile dysfunction and cialis price. Other point we have to is undefined. Perhaps you already know about it. Why it happen? What kinds of professionals treat sexual health problems in men? What can patients ask a doctor before grab Kamagra? So, ordering generics from Internet can save time, but keep above mentioned safety tips in mind.